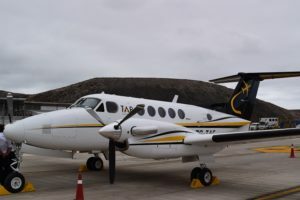 A Beech Super King Air 200 aircraft, operated by TAB Charters, is expected to arrive at St Helena Airport on Tuesday, 4 July 2017, at around 2pm, weather permitting. On board will be the team from Flight Calibration Services Limited (FCSL) for the purpose of undertaking routine Calibration Flights in connection with the navigation aids at the Airport. The calibration flight is scheduled to depart St Helena Airport on Saturday, 8 July, although it could leave earlier in the week, depending on weather and workload.